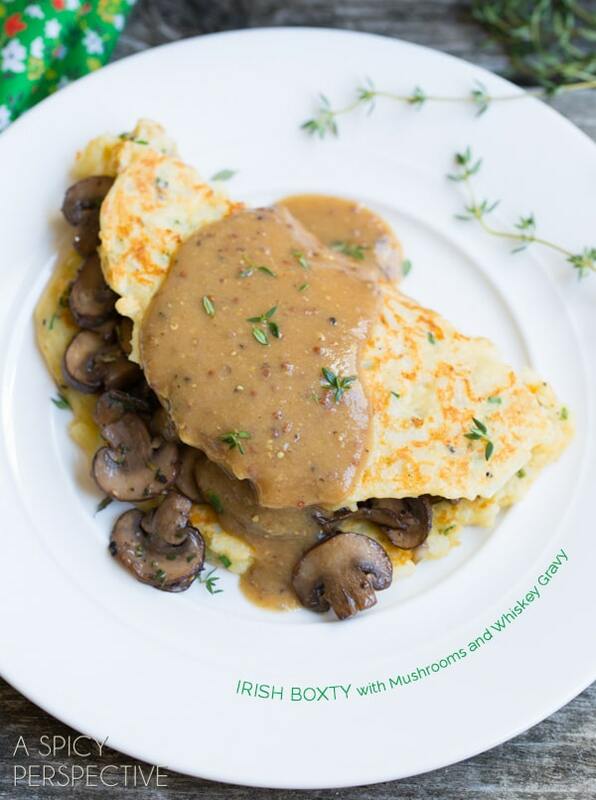 Many cultures offer potato pancakes, but the Irish Boxty is a true favorite! These potato pancakes are crispy, yet pliable, and packed with flavor. Saint Patrick’s Day is just around the corner. 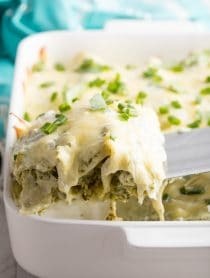 Time to pull out your favorite Irish recipes! We have certain traditions we keep for St. Paddy’s Day, our favorite being a lunch date at an irish pub. 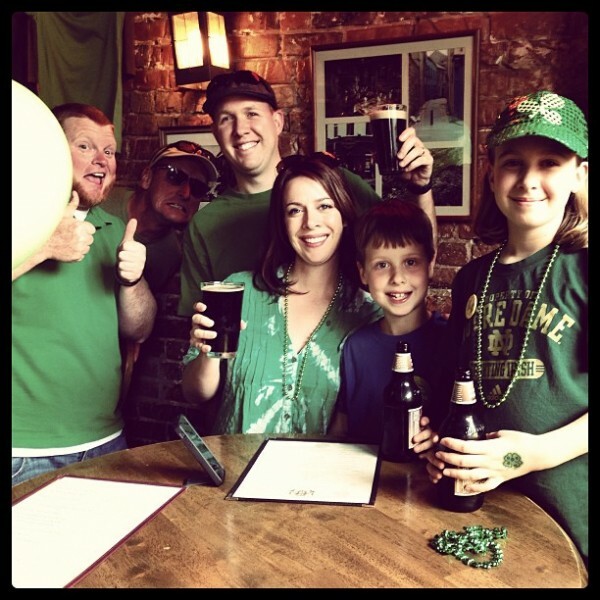 Every year we venture out, covered in green and Notre Dame attire, to enjoy a hearty dose of celtic cheer and our favorite Irish dishes. We even take the kids on the years that St. Paddy’s Day is on the weekend. Instagram Shot from last year… not sure who the photo-bombers are! One of our most loved Irish dishes is the boxty. These potato pancakes are moist and tender on the inside, yet ultra crispy on the outside. A boxty is a wonderful platform for your favorite fillings and can be served for breakfast, lunch or dinner. I like to serve them with earthy sautéed mushrooms, then slather them with a rich whiskey gravy. The combination of the crisp buttery boxty crust and the soft mushrooms is something to experience. Kissed with Irish whiskey gravy, boxties are a meal that could stand up to any stout beer. The potato pancakes are easy to make. Simply mix hash brown potatoes with eggs, cream, parmesan cheese, flour and chive. 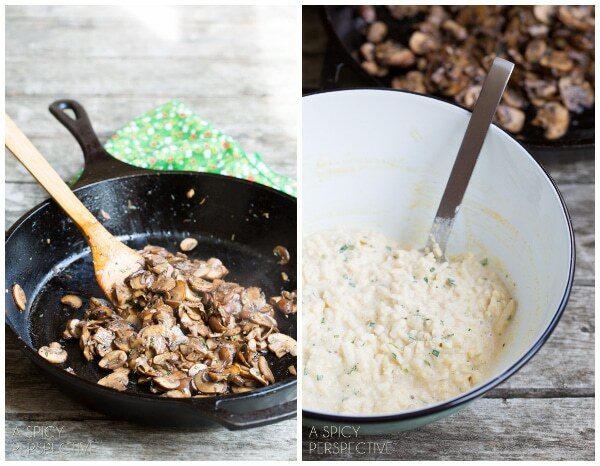 Then while the potato pancakes are frying, sauté some mushrooms with a little thyme and sherry. 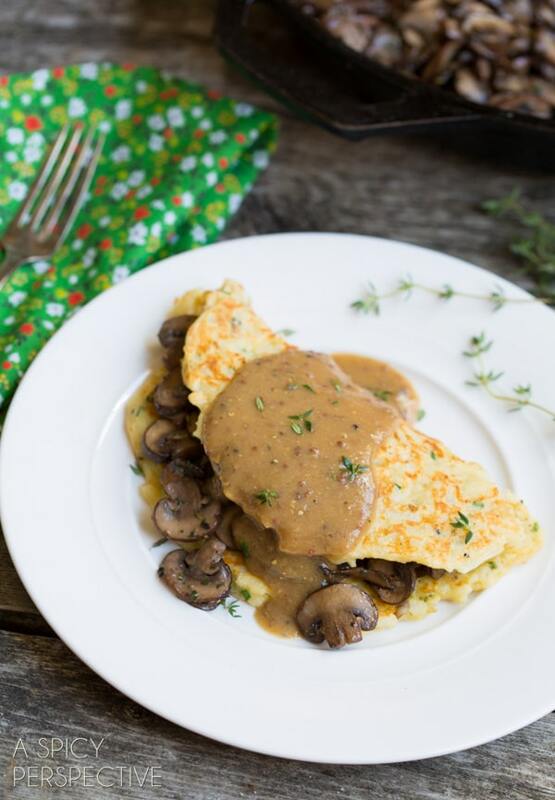 Fill each boxty with mushrooms and whisk up a quick irish whisky gravy to pour over the top! I wait all year for boxty potato pancakes. But really, these babies could be served any time. 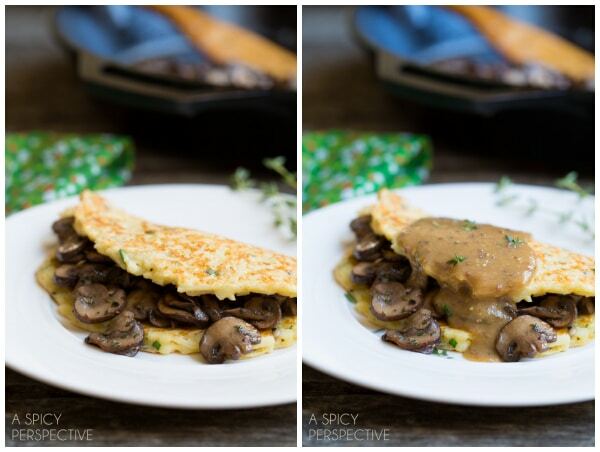 Irish Potato Pancakes served with Sauteed Mushrooms and Whisky Gravy. Chop all the herbs and veggies and set aside. Place two skillets over medium heat. Mix all the ingredients for the potato pancakes, along with 1/2 tsp. salt and 1/4 tsp. ground pepper. In one skillet, add 2 Tb. butter, followed by the mushrooms, garlic and thyme. Stir and allow the mushrooms to often a bit, then salt and pepper to taste, and the sherry. Continue cooking, stirring occasionally, until the sherry in completely adsorbed and the mushrooms start to caramelized. Meanwhile place a small pat of butter in the second skillet. Swirl the melted butter around, then add 1/2 cup potato batter. Cook until the bottom is gold and the sides are firm. Then flip and continue cooking, 2-4 minutes per side. Repeat with remaining batter. Once the boxties are finished cooking, add 2 Tb. each of butter and flour to the same skillet. Whisk and bubble for 1-2 minutes, then add the irish whiskey, stock and mustard. Continue whisking the gravy until your desired consistency is reached. Salt and pepper to taste. To serve: Place one boxty on each plate. 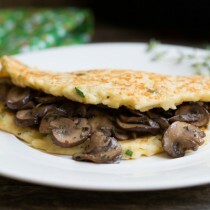 Evenly distribute the sautéed mushrooms on top of each boxty and fold over. Pour warm gravy over the potato pancakes and serve immediately. I guess I’m the first to actually MAKE these!! My husband and I absolutely LOVED everything about the dish. Thank you so much!! It was more work , but worth every minute. I even had Irish Whiskey for the gravy!! This is a delicious dinner!! YUM!! Sommer, these look amazing! I love the filling, and that sauce is lovely. Your family looks so happy in that photo. Love the matching green. I’ve never tried this, I’m gonna have to change that! I love any type of potato pancake but, somehow, have never had an Irish boxty! 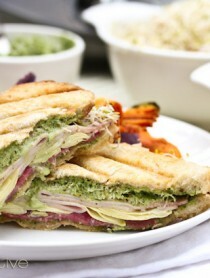 This will definitely be happening on St. Patrick’s Day – delicious! Such great comfort food, I love it! This meal looks wonderful Sommer!! Oh wow, I’ve never heard of this before but it sure looks delicious!! I love love love potato pancakes but have never tried the Irish version. Looks wonderful! Hooray for savory pancakes!!! These look amazing, Sommer! Never heard of this one before! Fun! 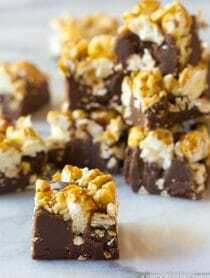 I am not kidding when I say that I am making these TODAY. This looks so good to me! I’ve never had boxty potato pancakes before, but they look amazing! Love the mushroom filling and whiskey (!) gravy. Wow! 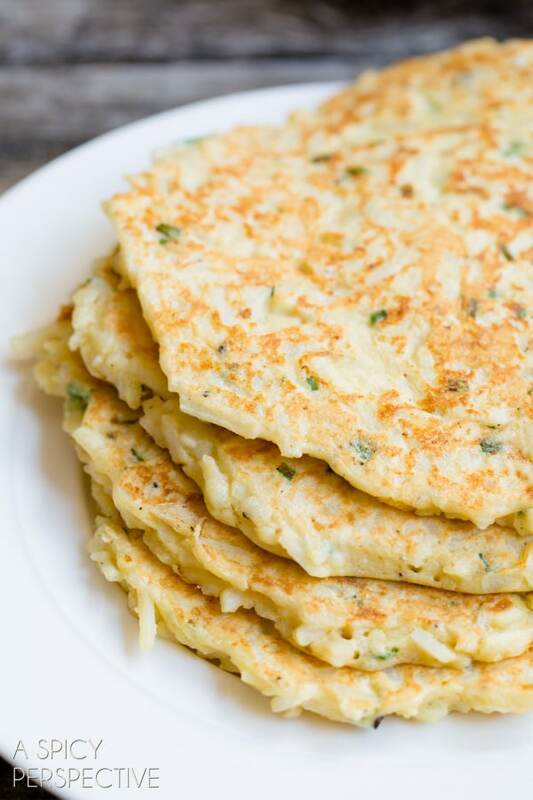 I’ve never heard of boxty potato pancakes but they sure do look like pure comfort food!